Renowned for its ski-in, ski-out location, this fun, family friendly 29 room hotel is located in the heart of Perisher Valley. 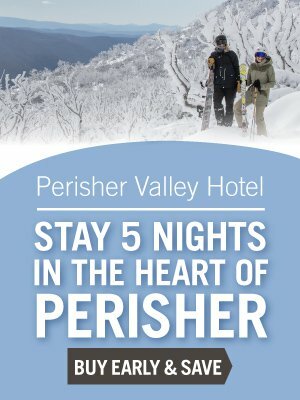 The Perisher Valley Hotel welcomes its guests to experience the genuine warmth and hospitality of its professional staff whose only goal it is to ensure your winter holiday is unforgettable. Providing all desired amenities, the hotel is conveniently located on the upper level of the Perisher Centre where you will find Snowsports School, Snowy Day Care, Snowsports Hire, retail outlets, bars and coffee shops. National Parks and Wildlife Service does not allow overnight parking in Perisher Valley. The hotel has very limited car parking bays available, which must be pre-booked prior to your arrival at $100 per car per night. Alternatively free parking is available at Bullocks Flat Skitube Terminal. Skitube operates every 20 minutes in peak times and hourly in the evenings providing safe and free parking during your visit. Check here for timetables and rates. To inform the Perisher Valley Hotel of your arrival please call our friendly reception team on (02) 6459 4755 and make your way directly to the car bay number provided by the hotel where our porter will arrange your transfer to the hotel. If arriving by Skitube call us on the free courtesy phone on the upper level and our porter will pick you up from the Aldo's end of the building for transfer to the hotel. If you’re driving from Sydney we suggest leaving between five and six hours to get here. If you’re coming from Melbourne it’s usually around a six hour drive. If you’re driving to Perisher from Jindabyne it’s an easy half hour drive in good weather; keep in mind that you're legally required to carry properly fitting chains in any vehicle other than 4WD's within the National Park. All details about entering the National Parks can be found on their website. There are a few things you need to be aware of when driving in the Snowy Mountains. Kangaroos and other wildlife are frequently seen, which is an amazing sight to see, but you don’t want to hit anything. Don’t use hot water to remove any ice on your windscreen – either scrape it away or use the demister. Canberra Airport is just a 2.5 hour drive from Perisher and a 40 minute flight from Sydney. Canberra is within a two hour flight from Sydney, Brisbane and Melbourne. In addition to these state capitals, daily flights also connect Canberra with Adelaide and Perth. Direct flights are also available to Newcastle, Singapore and Wellington, New Zealand. Singapore Airlines, Qantas, Virgin and Fly Pelican offer regular services to and from Canberra Airport. Canberra Airport is located 10 minutes from Canberra’s city centre. Perisher's Skitube is a Swiss designed rack-rail train that takes passengers from Bullocks Flat Terminal on the Alpine Way through a tunnel in the Ramshead Range to the Perisher Resort. The first stop is the underground station at Perisher Valley and then continues on to Blue Cow through another tunnel through the Perisher Range. When you arrive at Bullocks Flat Terminal, you'll find free day and overnight parking and because it is located below the snow fall levels, you generally won't require chains. You also don't need to purchase the National Parks entry fee. Since the start of operations in 1987, Skitube has carried over four million passengers to Perisher in comfort and safety. To this day, the Skitube is the most efficient and practical way to help guests experience the very best of Perisher while also taking in some beautiful sights along the way. Three of our four resort areas have free parking! A free shuttle service operates between Perisher Valley and Smiggin Holes. The shuttle service runs from 7:30am to 5:30pm. Pick-ups are from the turning circle at Perisher Skitube Terminal and the metal bridge outside the Smiggins Hotel at Smiggin Holes. Shuttles depart approximately every 15 minutes. Snow Transport - Driver trained, snow licence accredited and the longest standing private transport operator in the Snowy Mountains Region. Experience being driven to the snow by the professionals with over 10 years experience. Safety and reliability are at the forefront of our business. Premier 4wd vehicles plus buses for larger groups. Daily buses to both Perisher and Skitube departing Jindabyne and surrounds 7.45-8am each morning. Door to Door service with lockable trailer for all your gear. Private transport in premium 7 and 8 seat 4WD vehicles direct to your destination. Available to connect with every flight from all airports and can cater for all group sizes. Fully licensed and insured. Ph. 0497-888-444, More information here. Alpine Charters is a local family operated business that provides excellent customer service, safety and is accredited in both NSW and the ACT. Servicing the Snowy Mountains region Alpine Charters can meet you at your desired pickup point, including Canberra Airport, Snowy Mountains Airport or anywhere in between. Alpine Charters provides private transfers for groups of all sizes. Snowlink Shuttle operates a daily return door to door service from Jindabyne to Skitube at Bullocks Flat and also a direct shuttle to Smiggin Holes and Perisher Resort. Snowlink also offers a professional and private 4WD transfer service to & from the Snowy Mountains airport to connect with Perisher Resort. To book phone: 0438 385 961.